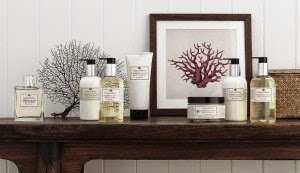 Crabtree & Evelyn announces the launch of its Caribbean Island Bath and Body Collection. This new fragrance collection contains tropical citrus notes including spider lily, bergamot, mandarin, jasmine and plum. Caribbean Island Wild Flowers bath and body products consist of Eau de Toilette (£19 for 30ml and £39 for 100ml) containing heart notes of spider lily with a blend of wild island flowers, tropical citrus fruits, night blooming jasmine and sea air accords; Body Wash (£18 for 300ml) containing hibiscus and honey extracts to help tone and hydrate along with moisturising glycerine; Body Lotion (£22 for 300ml) containing olive oil, conditioning mango seed oil and hydrating honey extract; Body Cream (£30 for 200g) containing grapeseed, olive and mango seed oil combined with shea and avocado butter for smooth skin; Body Polish (£20 for 175g), a foaming body polish containing aloe vera blended with grapefruit peel powder and avocado stone granules to exfoliate the skin whilst glycerine and soybean oil moisturise; Hand Wash (£16 for 300ml) formulated with avocado, honey and aloe vera extracts; and Ultra-moisturising Hand Therapy (£22 for 300ml) formulated with conditioning shea butter and macadamia nut oil to moisturise and soften hands. The Crabtree & Evelyn Caribbean Island Bath, Body and Home Collection replaces the India Hicks Island Living Collection and launches this month.